Filled with aromatic spices, lentils never tasted so good! This healthy red lentil dal is inexpensive, nutritious, high in protein, and brimming with flavor. After that curry kick took over the blog a few months ago, you’d think we would be over curry in this house. My love of curry just doesn’t seem to have an end though so I’m back with one you won’t want to miss! This red lentil dal is light, healthy, and loaded with flavor. I love making quick and easy weeknight recipes like this. One pan and about half an hour and this recipe is on the table, ready to rock. Red lentils are a must when it comes to quickness. While other types of lentils can take up to half hour to cook, these little guys are done in half that time. And what hungry person doesn’t like quick? Exactly my thinking. 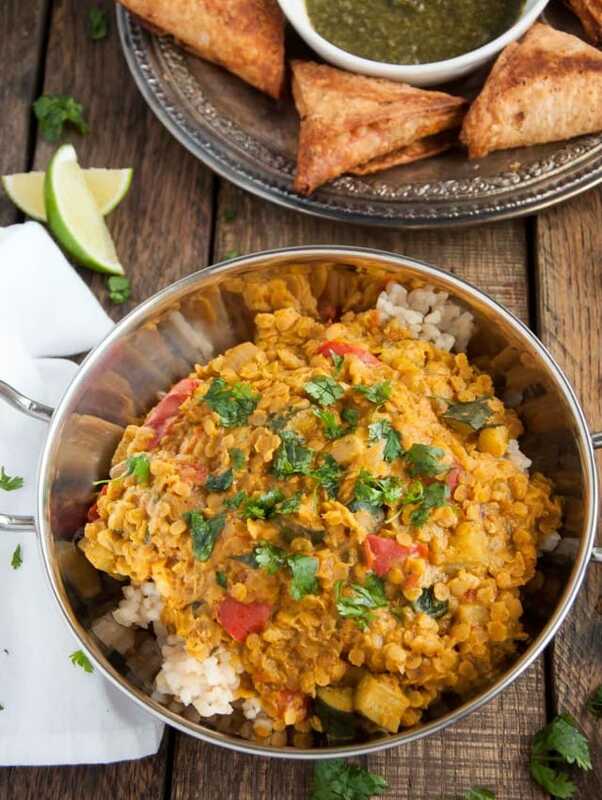 Plus, one serving of this red lentil dal has 15 grams of protein and over 18 grams of fiber. Yes, that’s just one serving. Where has this red lentil dal been all my life? And, although I wish I could claim that the samosas are made from scratch, they’re definitely not. Someday I might be brave enough to conquer a recipe like that, but in the mean time, Trader’s Joe’s is going to have to meet our samosa needs. Disclaimer aside – I have to say, TJ’s has a mean samosa game. These little pockets of Indian flavored deliciousness are a new addition to my Trader Joe’s favorites list. My only complaint is that I wish they came with more mint sauce. It was getting rationed out like liquid gold over here. Stop being stingy with that mintiness TJ! Share the wealth already. Back to the red lentil dal. Don’t feel restrained by the ingredient list! You can sub in a can of diced tomatoes if you don’t have fresh ones on hand. On the same note, the zucchini can be swapped for your other favorite veggie. This recipe is as flexible as it is delicious, ma frands. The ingredients that are harder to sub out are the spices. And Indian food is all about the spices. f you haven’t upgraded your spice cabinet to include the likes of garam masala and turmeric, you probably should get on it. Once you get the right spices, the exotic flavors that before were only achievable through restaurants and take-out, can be made with your very own two hands. There’s nothing wrong with a little take-out here and there but there’s something sooo much more rewarding in making it yourself. Also, sooo much healthier! When you get to see what’s going in, you can swap out the butter and choose healthier ingredients to guarantee that your meal does more than taste good. Choosing health conscious foods like lentils, coconut milk, and veggies will energize you and give your body the nourishment it needs. And I’m sure we could all use a little help in the vitamin department. I know I certainly need all the health food I can get after welcoming on a new decade this week. Yup, I went through what is widely known as the ‘dirty thirty,’ transformation. It was a fabulous night, butttt, since I am 30 now after all, the party was followed by a two day hangover. Goodbye 20’s. My inner lush will miss your ability to bounce back and rebound like it ain’t no thang. Welcome 30’s. Bring on the knitting. In other not so old and frumpy news – we’re leaving for Africa in four days!!! FOUR! Africa!! I can’t freakin’ believe this trip is already here. And my last day of work is Tuesday. Eeek! What a crazy and exciting week. Heat ½ Tbsp. coconut oil over medium heat. Once oil is melted, add onion and cook for about five minutes until onion is soft and starting to brown. Add zucchini and cook 2-3 minutes longer, stirring often. Add remaining half Tbsp. coconut oil. Add garlic, ginger, curry paste, and all dry spices to pan and cook while stirring for 1 minute. Add coconut milk, water, lentils, and chopped tomato. Bring to a boil (2 - 3 mins). Reduce heat and simmer for 12 -15 minutes, until lentils are tender but not mushy. Add lime juice and stir. Serve curry over rice and garnish each bowl with chopped cilantro and additional lime wedges if desired. First, how was Africa!? What a cool adventure! Second, I loooove red lentils and have been eating boatloads of them lately (in my hybrid version of kitchari, which usually uses mung beans). I can’t wait to give your dal a try!